At least it's good to see that Media Vision's still kicking and hasn't keeled over and died like various other beloved developers have of late due to the economy. I liked the Wild ARMs games. I admire your pro-speciest approach. ANIMUL RIGHTS! Draconian rights!!!! And yeah, that sounds amazing. I guess no chance of the wonderful weirdos at XSeed or NISA picking it up or is that way "Sega" keeps getting mentioned because they don't do much at all? I'd assume that if anyone were to localize the game it would be Atlus, what with being owned by Sega now. But really, who knows what their exact relationship is. They might not quite have the rights to. But man, do want this game. So, so, so want. Of course, now that I've said it, my inner pessimist is telling me that the whole Dragon MC is a smoke screen for the eventual typical JRPG idiot-hero harem-lead stealth-protagonist. Especially when I look at the "Dragon's" first and last name and think "Dragons typically don't have a first and last name." 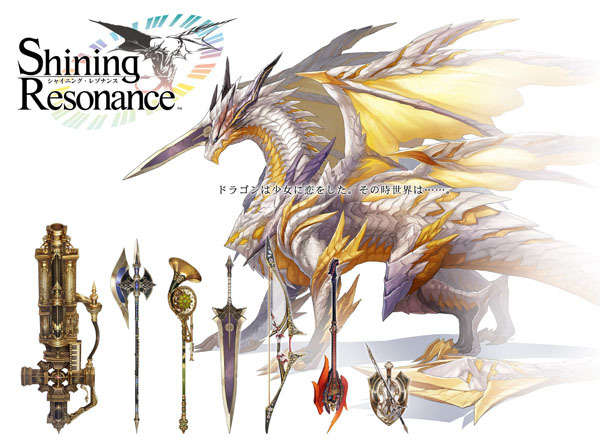 (also, its a dragon with a sword that's probably going to become the MC's sword once he becomes a real boy). Definitely no need to get excited over a game that will likely never see an English version. Honestly, though, I'm on the fence about importing this. I feel that with Sega owning Atlus now this actually has a good shot at making it over. Also, the biggest thing holding back the more recent Shining games is that they were on the friggin PSP. Not an issue here. I am a little disappointed by the move away from the Valkyria Chronicles-esque system to something more action-y, though. Kouryuu could very well be some sort of title. That's what I'm choosing to believe: it's a title. The Shining Force games on PS2 area almost universally awful. I hated every single one of them for different reasons. Thanks for the heads-up. I guess it's a good thing I missed out on them then. Instead I think I'll give those Shadow Hearts games a try which everyone is speaking so highly of. I'm finally on twitter. If you're a history buff and/or interested in video games history and random rpg stuff, check out @masakadojo. Well, "kouryuu" written with those kanji literally means glimmering/shining/etc dragon. (Probably shining in this case...) In addition, the fact that it's written with kanji at all makes it very likely to be a title and not a first name. You just don't see names that mix kanji and kana like that. Well, no, mixed kanji/hiragana names aren't uncommon at all. In fact on the contrary I would say that they're quite common. Mixing kanji with katakana (like was done here), on the other hand, is certainly uncommon but still not at the "you just don't see" level. There would generally have to be some sort of special reason for it. I think a more convincing argument is that the dragon appears to have a very western-sounding given name ("Irvan") combined with something obviously Japanese (Kouryuu) and it's not like this is supposed to be a mixed-blood dragon or something...I'm not sure that would even make sense in the setting here, it's a seemingly western fantasy world. So it probably makes more sense to think of Kouryuu as a title. Yeah, I misread the title when I initially posted my concerns. That said, seeing Irvan's forehead sword with a hilt and everything alongside the other characters' weapons isn't helping matters at all (at best, it might just be this game's Ring Merging/Pulling Swords Out of Chests/etc. mechanic; at worst, there's going to be some human hands for that sword hilt). Had to post for that awful Armonics pun. I'm more fixated on them writing "Halbred". Maybe it's two types of spears that were smithed (ie; bred) together to make the "Halbred". Reviews on these games are typically mixed, no? I wonder if Team WildArms can change things up... Either way, things look quite lovely (and graphically, is it just me or does it look a TON like how the new Atelier games look?). Most importantly, something was officially released in English regarding this so I guess that's some hope. The Japanese special edition comes with a figure (sculpted by Alphamax), in case anyone is interested. I don't really have a link to the announcement, but it's up on Amiami.